Usually in rich deciduous forests and floodplain forests, surviving considerable disturbance and clearing; rather local northward. The common and scientific names derive from the bright red-orange sap, which “bleeds” from the broken rhizome and other parts. 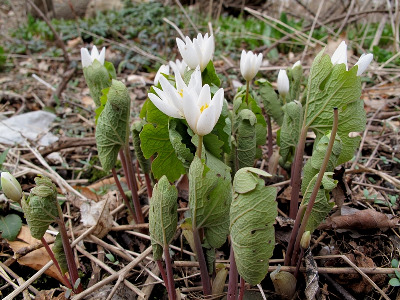 This familiar wildflower blooms in April (or early May in the north); the petals are normally white, though rosy-flowered forms are reported. A single 1868 Isle Royale collection is at MICH, with no collector but "Donor A.B. Lyons." Lyons apparently never collected on Isle Royale, and the Isle Royale specimens were likely duplicates from the 1868 University of Michigan party that collected on Isle Royale, with plants the responsibility of A. E. Foote. The only 1868 Foote collection of Sanguinaria, however, is from Ontonagon Co., and this specimen may have been inadvertently mislabeled Isle Royale. It is not mapped, but nevertheless, Sanguinaria should be looked for on Isle Royale, as it occurs north of Lake Superior in Ontario. MICHIGAN FLORA ONLINE. A. A. Reznicek, E. G. Voss, & B. S. Walters. February 2011. University of Michigan. Web. 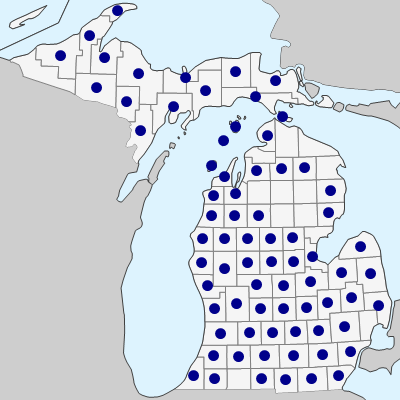 April 21, 2019. https://michiganflora.net/species.aspx?id=1901.